Many miles, but mostly on trail with a fairly short, easy scramble. Extremely easy to tag Banshee too. Beautiful part of Rainier National Park. Trail all the way to Panhandle Gap in great condition. Easy to hike over the few existing patches of snow. Refill water at the log crossing just before Panhandle Gap. There was a small stream in the meadows on the way to Banshee, but not sure if it's there year round. What a beautiful day it turned out to be! The views were spectacular and we had a nice breeze almost the entire time which kept us cool and also kept the nasty bugs away. This was a weekday scramble so parking at the Summerland TH was no problem. We made good time to Summerland. We past a group of trail workers who had put down gravel in that deteriorating section right after crossing the bridge over Fryingpan Creek. Nice work! Filtered water at the second log crossing before Panhandle Gap. Took the bootpath going east at Panhandle Gap and followed it till we reached the lupin filled meadows of Banshee. Saw the resident goats, but too far away to photograph. Tagged Banshee and took a 15-20min break. At this point 2 people changed from their trail shoes to boots before leaving Banshee's summit. 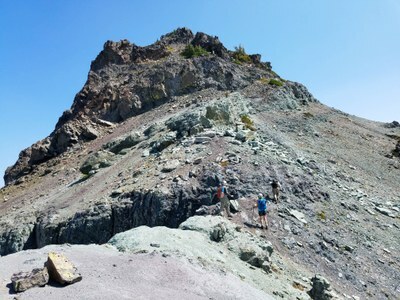 Dropped down about 400' and traversed over talus and soft snow to the saddle between Central Cowlitz Chimney and Point 7240' with no problems. At the saddle we put on our helmets, emptied our packs of things we did not need and headed for the summit - about 200' of scrambling. There was a large cairn at the beginning and then we just circled a bit to climber's right and up. There is a faint bootpath, but there are several ways you can do this. Spent a good half hour or more on the summit. Views looking east were now not so good due to the smoke, but Mt Rainier was still fairly stunning. Retraced our steps on the descent. The bootpath from the summit to the saddle was now more visible. Traversed back towards Banshee, but gained only about 200' before we continued towards Panhandle Gap. Filtered water at the same place, the 2 people put their trail shoes on again and the rest of the hike out was effortless although the breeze had stopped and it was definitely warmer by the time we reached Summerland. Quite a few groups near and at Summerland. Unfortunately Watipi Woolies was closed by the time we got there so no ice cream for us...darn! Besides that, it was a great day with wonderful conditions and company. 15 miles/5000' gain/10 hrs - RT.